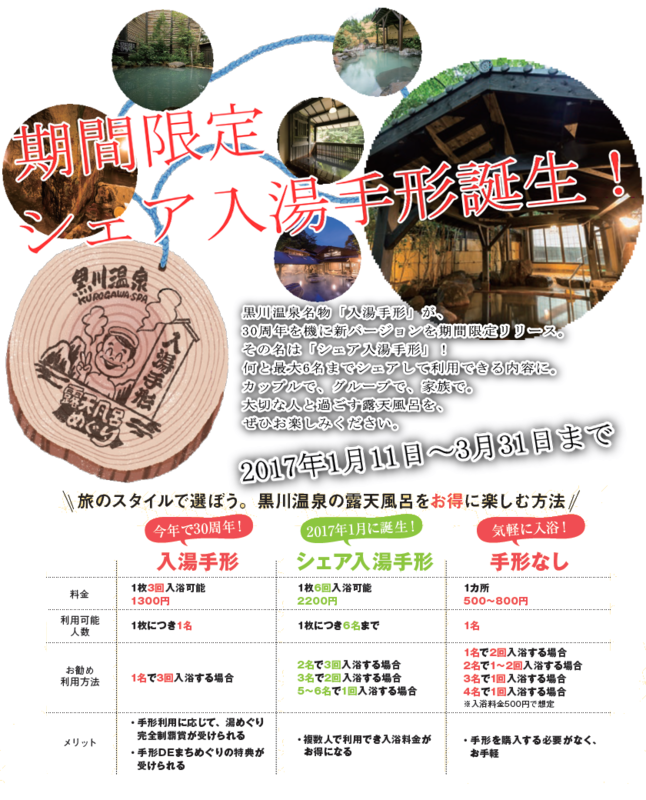 Since the middle of January a new type of shared onsen-hopping pass （シェア入湯手形　sheya nytotegata)　has been on sale at the Visitor Center in Kurokawa. Ideal if you are visiting with a group of friends the pass costs only ¥2200 and allows a total of 6 entries to the baths. (Single entrance to a bath is usually between ¥500 and ¥800,so you could easily save at least ¥800) here are some sample combinations for your shared pass! So if you are visiting Kurokawa with a group of friends in the near future,please give it a try! Exploring a fairly new hot spring complex on the outskirts of Kurokawa today, Iromomiji （彩もみじ, not yet on the English onsen-hopping map,but tucked up a hill just a stone`s throw from Konoyu,which is number 23 on the map). The receptionist explained that they opened last October,but were forced to close for a while after the April earthquakes and just reopened this September. It`s a fairly long walk from the visitor center,a steep climb at the end but apparently there is a shuttle bus (although I`m not sure if you have to phone for the bus ,possibly you do need to as I didn`t see it shuttling anyone backwards and forwards this afternoon….) Parking space may get a little tight at busy times,as there is also a soba restaurant next to the main outdoor bath and a mini village of at least six private family baths dotted in amongst the rocks and trees. These can be rented for a period of 50 minutes for between 1000 and 1500 yen and did look very attractive. But today I`m here for the purpose of outdoor onsen-hopping,so here`s the entrance…..
Lovely wooden interior,shiny dark wood floors and comfortable changing rooms with lockers and everything you need…. a flight of stone steps leads down first to a spacious indoor bath…. ….and then to the bubbling jacuzzi-style outdoor bath….which is actually quite unusal for outdoor onsen hop bath tubs! Also offered within the shiny and new onsen-hopping designated area are a sauna and a medicinal herb tub.The main bath is quite hot today and whoops….I forgot to look up what type of hot spring waters flow here….it`s not a sulphorous smell,I`m guessing a mild alkaline,which is good for all skin types and said to smooth the skin. Next door to the bathing area,behind a huge,imposing wooden entry gate, is the newly-opened (10/10) Gekkoju Ryokan （月光樹）　which offers 8 very private,tastefully decorated bungalows complete with private indoor and outdoor baths and amazing views…start saving for a stay here. Would I visit again? Yes,anytime! Staff: Very polite and helpful,litle English.